Now TV is an internet television service that is owned by Sky. It was launched in July 2012 and offers films, box sets and one off TV programmes such as documentaries to its customers. They also show a considerable amount of sport. Customers use Now TV by paying monthly for their account and the service has grown in popularity since it was first established. Anyone can have a Now TV account as it is a standalone service and you do not have to be a Sky customer to have an account. Many people enjoy the wide variety of television and movies that are available as part of their Now TV package, but if you are a user, you might find that you don’t use it often enough or you might even be unhappy with the service and therefore wish to cancel your account. Here is a handy guide on how to quickly and easily cancel your Now TV account without any hidden fees or charges. 1 How does Now TV Work? 5 What TV Shows are Available on Now TV? Now TV is advertised as a ‘no contract’ subscription service which means you should be able to cancel your subscription and rejoin the service at any time. Once you have joined, you will have access to TV shows, sport and movies at no extra cost. All you have to do to join the service is to create an account with your payment details and then if you are watching on your mobile phone or tablet, download the Now TV app and log in using your log in details – you will then have complete access to your account and the TV service will even remember your favourite shows and save them in convenient places for you to find quickly and easily. Some Now TV movies even include the biggest blockbusters fresh from the cinema. Now TV is available on over 60 devices and has won several awards including Which? Best Buy. If you did choose Now TV’s ‘contractless’ entertainment then you will have selected one of their four available passes. The entertainment pass which allows you to watch must-see TV shows at £7.99 a month or the Sky Cinema Pass which allows you to choose from over 1000 movies including a new premier every day – this will cost you £9.99 per month. For £.99 you can buy a kids pass for the little ones and for £6.99 you can get selected sport from Sky Sports. You can combine the passes at any time, adding extras to your subscription. What really attracts people to use Now TV is the fact it offers its users a free trial on certain passes, before signing up. A 14 day free trial is available on the Cinema and Entertainment passes and if you cancel before the trial ends, you will not be charged the monthly rate for the pass you have selected. Due to the service not being contracted, you can easily cancel your subscription at any time and only the monthly payment that you owe will be taken from your account – nothing more. Once you have an account, you will be able to view the details of your subscription by logging into Now TV and selecting the ‘account’ option. This will tell you exactly what you are entitled to in your subscription and is also the quickest way to go about cancelling it. 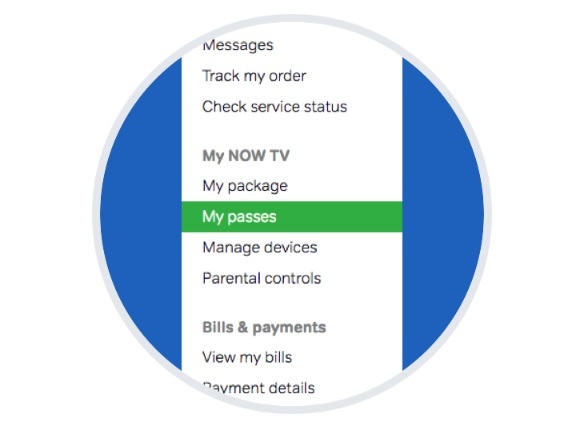 Because you can purchase more than one pass when signing up to Now TV, you might just want to delete a specific pass off your subscription, rather than cancel your membership altogether. If this is the case, please continue to read as this will be highlighted a bit further on. Please note, that the cancellation option is not available on the Now TV app or on any mobile devices, you will have to go to the Now TV website and select your account from there. Once you have accessed your account online, you are ready to begin the cancellation process. As you can see, this user is paying for an entertainment monthly pass and they can cancel at any time by selecting the button below. If you are unsure of what you are doing then there is a handy FAQ’s section just to the right of the page – there is probably someone struggling with the same issue as you. When you are ready to end your subscription with Now TV (the service is ‘contractless’ so if you wanted to re-subscribe at any time, you can) then go ahead and press cancel. You will be able to continue using your Now TV account until the end of the month (or until the next payment is due) so if you have just paid for a month’s membership you will not lose out by losing your access straight away. You may have noticed in the picture above, that Now TV is set to increase in price per month with their entertainment passes, this could be another reason why members may now wish to cancel. You don’t have to start paying for Now TV straight away, you can sign up for a free trial and see whether you think it is worth the money. The trial will last 14 days and is available on the Now TV movies pass. With most free trials (including this one), you are still required to enter your payment details so that your membership can automatically upgrade to a paying member without you having to do anything. This is all well and good if you are impressed with the trial and do want to commit to being a full time paying member, but if you have decided that Now TV isn’t worth your while then you need to cancel or end your free trial before payment is taken. Unlike Amazon Prime, there are no reminders available on Now TV to set to ensure that you are aware of when your trial is ending so it is best to make a note of the date so that you are not caught short. If you log onto your account and follow the steps above, you will see your free trial in the ‘my passes’ section. if you click on it the page will tell you how long you have left of the trial. If it is coming to an end, you simply click the ‘cancel’ button (as shown above). This will make sure that your subscription to Now TV does not upgrade to a paid membership when your trial ends. Your details will be saved by Now TV so if you did want to re-register you will be able to start paying for a membership straight away, without having to go through the registration process all over again. Just as if you were paying a membership, cancelling a free trial on the day you registered does not mean your access to movies is denied straight away, your subscription will run until the end of the trial regardless, so a tip would be to sign up and cancel straight away to save you forgetting later on, if you have no intentions of actually being a paid member. Please note that if you remember to cancel on the day that your subscription renews – you may have remembered too late. The cancellation button won’t work if the company is attempting to take payment, which they may well be on the day. Of course, you may be cancelling your Now TV membership simply because the payments don’t suit you any more or you don’t use the service, but there may be other reasons that you wish to cancel your membership such as receiving bad customer service from a member of the Now TV team or being involved in a dispute over payment. If you feel that you have been unfairly treated by Now TV or Sky then there are complaints numbers available to call and live chat services available on their website. Now TV pride themselves on delivering an exciting yet reliable service to all of their customers and so would definitely like to know about it if a customer is unhappy or even has some suggestions for change. You can find the Now TV head office address on their website if you would like to address a letter to them. What TV Shows are Available on Now TV? The Now TV Entertainment pass gives you access to hundreds of your favourite box sets, including exciting television shows that you wouldn’t have seen before. Old school classics include the legendary Faulty Towers, and popular watches include Game of Thrones and House of Lies. The shows are set out depending on your preferences and any shows or box sets that you have begun to watch will be available to catch up on in their own category. New releases are added to the service regularly, whether that be an old box set classic or an exciting new drama. Unfortunately, that does also mean that shows are deleted. To avoid a box set or series being deleted when you are part way through watching it, Now TV will always tell you how many days are remaining for the show of your choice to stay with the service. Any new releases are listed at the top of the page. If you have signed up to Now TV but are unsure what you would like to watch then you can search a show or series by channel to make sure you don’t miss anything that you might enjoy. Now TV also recommends shows or box sets based on your viewing preferences and genres that you have previously viewed. You can get in touch with Now TV to find out what new shows are coming to the service and when to see if signing up will be worth your while. Cancelling Now TV should be an easy process if you follow the instructions set out above, but of course, you might encounter some problems along the way. if you find that you have cancelled your account but payment for the month has still been taken you will need to contact Now TV to discuss the issue. As mentioned earlier, Now TV cannot be cancelled on the Now TV app, you will need to sign into your account online. If you have selected to cancel your subscription, you will receive a cancellation email confirming everything within three hours. If you do not receive this email, then it is possible that you have not successfully cancelled the subscription. If you are not sure, then it is always best to ring up and check to avoid having the payment taken. If the payment has already been taken and you did get a cancellation confirmation, then you will be eligible for a refund.